The RPI ratings have noticed. The national college basketball media has noticed. But has the NCAA Tournament committee noticed? Tonight, they’ll get their chance to see how good a team is playing in Buffalo. The nation’s college hoops fans will also get a chance. 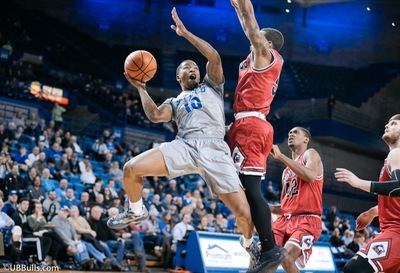 The Buffalo Bulls (13-5, 5-0 MAC) will visit the Western Michigan Broncos (11-7, 3-2 MAC) in a game that will be broadcast nationally on ESPNU, on a night where there aren’t a lot of other college basketball games. The Bulls were the preseason pick to win the MAC’s East Division. The Broncos were the pick in the West Division. It could be a preview of the MAC Championship game. While that title game in Cleveland in March will decide which conference team goes to the NCAA tournament, the Bulls are hoping to be in the mix for an at-large bid should they stumble on the way to the championship. But UB Head Coach Nate Oats is quick to remind everyone that the Mid-American Conference hasn’t had an at-large team in 20 years. UB’s resume to date would put them in the mix. They are 28th in the latest RPI rankings, the 2nd highest team from a mid-major conference. Their resume includes narrow losses to Cincinnati, Syracuse and Texas A&M. They have won their five conference games by a margin of 19 points. All of that has attracted some attention. Oats knows that means some decision makers will be tuning in Friday. He knows his team will need to respond. The Bulls 5-0 conference start is the first by a UB team since 1998, even before they were in the MAC. They have scored over 80 points in six straight games for the firs time in over 40 years. They have won five straight by more than 10 points for the first time since 2004. Oats knows that big wins carry weight with voters and committee members, and he has encouraged his team to keep their foot on the gas late in games. If it’s another 10 point or more win against the Broncos, it will go a long way towards sending the Bulls to their third NCAA Tournament in the last four years.